Last month, I gave a presentation to a group of senior transportation and supply chain executives. It was entitled “Predictable Surprises,” because it addressed how transportation and supply chain professionals can eliminate unpleasant surprises by looking at and evaluating issues in the transportation industry, and projecting how those issues will affect their companies. For example, I mentioned how the labor disruptions at our west coast ports in the latter half of 2014 and the first quarter of 2015 were entirely predictable. Anyone following the transportation industry could see that there was a strong possibility for significant disruptions at our west coast ports (after the contract between the ILWU and the PMA expired on June 30, 2014), and that it would make sense to divert freight to other ports on the east coast. But a large number of shippers believed the representations from both sides, who stated they would continue to work together until there was a contract, and those shippers continued to route their imports through the west coast ports. Bad move! The labor dispute wore on, the ILWU slowdowns threw the ports into a chaotic state, and after approximately a half million containers were held up, the Obama administration intervened. But, once again, this whole predicament was a predictable surprise. During my presentation, I also addressed what is likely to happen with transportation rates over the next two to three years. Specifically, if the carriers have to pay their drivers more money (and they do), and the costs of equipment and insurance increase (as they certainly will), and the government continues to impose regulations or legislation that increases the cost of doing business for truckers (a fairly safe assumption), then transportation rates will go up. In fact, it is entirely predictable that rates could go up by as much as 20% over this time period—especially if the economy gets any kind of strength. After the presentation, I received an e-mail from one of the attendees with a question I get asked frequently: “How much will my rates increase next year?” The answer to this question is always the same: “It depends.” In today’s sellers’ market, we’ve seen some very extreme pricing. Some companies are receiving small rate increases; other companies are seeing double-digit rate increases. If you are wondering what is likely to happen with your transportation rates, there are three things you need to do. 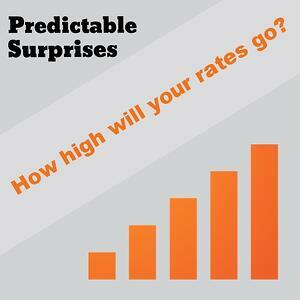 First, benchmark your rates to determine where you are at relative to the market. According to a recent Transportation Procurement Benchmark study, “85 percent of small and medium-sized shippers, and 62 percent of large shippers either don’t benchmark their rates at all, or only use internal benchmarks….” A benchmark analysis can help you understand the opportunities or challenges as you head in to negotiations with your carriers. Second, ask you current carriers for their operating ratio (and the data) for your business. If you really do have collaborative relationships with your carriers, ask for as much data as they are willing to share from their operating ratio worksheet so you can understand the costs to drivers in handling your freight. Here is why this is important in understanding the potential for, and magnitude of, rate increases: your LTL carriers want to see operating ratios in the mid to high eighties, or low nineties. So if your operating ratio with a carrier is over 100, then you can expect—unless there are some unforeseen factors—a sizable rate increase that will allow them to get that ratio under 100. If a carrier’s operating ratio is in the high 80s or low 90s, then we would predict small to moderate increases in your rates. Third, make sure you understand how your book of business fits into the lane networks (footprints) with your carriers. In today’s LTL environment, where understanding dimensional and density issues is critically important, you need to make sure that your freight runs well in your carriers’ networks. Practically speaking, your freight may be more attractive to one carrier than it is to another carrier. The more attractive your freight is to that carrier, the better your rates will be. At the end of the presentation, I gave this challenge to the audience: If all of this stuff (a.k.a the likelihood for carrier rate increases) is predictable, what are you doing to prepare for it? Waiting to negotiate until your carriers propose a rate increase can spell disaster. That is why I encouraged the audience, just like I am encouraging you, to be proactive and do the things that are necessary in order to effectively manage your truckload and LTL freight costs. Avoid an unpleasant surprise and take the steps I outlined above to predict what your rates will look like in the next few years. If you would like a copy of my “Predictable Surprises” presentation, just send me an e-mail at reganmike@tranzact.com, and I will be happy to send it to you.